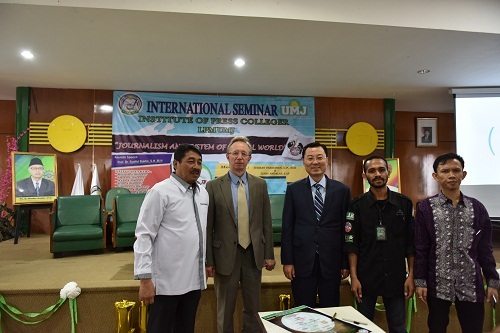 It is my great pleasure to join you today at the international seminar hosted by Jakarta Muhammdiyah University(UMJ). To begin with, I'd like to extend my warm congratulations on the 6th anniversary of the LPM (Lembaga Pers Mahasiswa) UMJ. The topic today is "International journalism and its influence on global order". It is a grand and cutting-edge topic. International news is a window to the world. 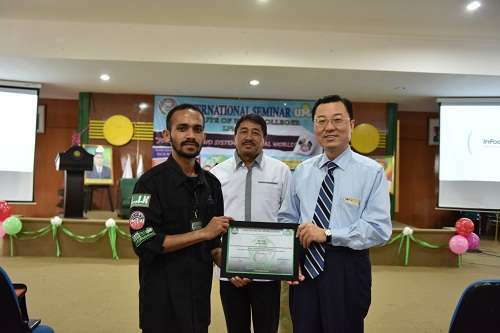 It helps us to know and understand other peoples, religions, cultures and countries across geographical boundaries and has a profound impact on foreign policy making, international relations and global order. In recent years, with the vigorous development of the internet and social media, international news is no longer high-end and everyone now can be a news source and a news spreader. The international news has been woven into the daily life of ordinary people, and plays a stronger role than ever before. However, just as every coin has two sides, fake news, clickbait and online rumors can neither be ignored. Mark Twain has said in the 19th century that "A lie can travel half way around the world while the truth is putting on its shoes." In the age of digital media, the rumors can travel around the world twice. At this moment, more than ever, we need the real journalists to stand out, to be a champion of righteousness and justice, uphold the journalism spirit and ethics, respect the facts, restore the truth, eliminate misunderstanding and spread friendship. As Chinese Ambassador to Indonesia, I'm pleased to see that in the last three years, quite a few Indonesian journalists have made objective and fair coverage of China, support the growth of China-Indonesia relations, and made their contributions to the mutual understanding between our two peoples. A journalist from Bisnis Indonesia wrote after coming back from China, "I'm not the kind of person who easily feels astonished or amazed, but every time when I visit China, I always feel surprised. The country with more than 1.3 billion people is becoming so advanced and modern, and it can be managed in such an orderly manner." As China and Indonesia are exploring cooperation in building the Jakarta-Bandung high-speed railway, many Indonesian journalists have paid visits to China to take and experience the bullet train. They wrote in their articles, "China had built 20,000 kilometers of high speed railway with a set of sophisticated procedures, high standards, advanced technologies and reliable operating system. It's not only safe, but also comfortable. " A journalist from detik.com even took photos and wrote down every step during his whole journey, from buying a ticket to arriving at the destination and showed to the Indonesian people. As Indonesian people have great interests in the religious life of Chinese Muslims, many Indonesian journalists have flew to China and visited Muslim communities in Xinjiang and Qinghai to send back the first hand reports. A journalist from the Liputan6.com wrote in her report, "mosques in various sizes and styles can be seen everywhere in Xinjiang. The story saying that the Chinese government ban Uighur Muslims from worship is not a fact at all. Just like the life in Indonesia, whenever there is an adhan from the mosque, all the Muslims at the neighborhood will go to the mosque and pray, five times a day. We never see restrictions upon religious activities." And last year, the chief editors or managing editors from media including Kompas, Metro TV and Vivanews, attended Eid al-Adha prayers in Niujie Mosque in Beijing together with Chinese Muslims and communicated with the Imam. They took and posted a lot of photos and videos. With these reports, more and more Indonesian people understand the real life of the 23 million Chinese Muslim brothers and sisters, as well as the freedom of religious belief in China. Chinese media also spare no efforts to introduce wonderful Indonesia to Chinese people. 6 Chinese media have assigned resident correspondents to Jakarta and numerous reporting teams visit Indonesia each year. Last year, a team from Chinese Central Television traveled around Indonesia and produced a 15-episode special program, with a comprehensive introduction of Indonesian economy and society, tourist attractions such as Tanah Lot Temple in Bali and Borobudur in Yogyakarta, customs and traditions as well as local cuisines throughout Indonesia. Such programs have attracted more and more Chinese tourists to visit Indonesia. Last year registered a record number of 1.45 million tourists from Chinese mainland, making China Indonesia's largest source of overseas tourists. Official statistics from the Indonesian government show that Chinese tourists spend an average of USD 1,107 per person, contributing almost USD 2 billion to local revenue. In the first two months of 2017, more than 400,000 Chinese tourists visited Indonesia and the total number is estimated to surpass 2 million this year. The increased media reports arouse the interest and enthusiasm of the young people from both China and Indonesia to know about each other. More and more students go to the other country to study. 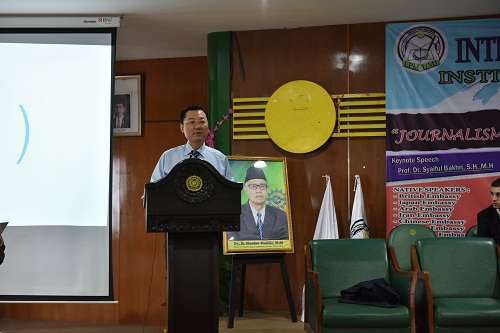 Now there are 14,000 Indonesian students studying in Chinese universities and China is the second largest destination for Indonesian students to study abroad. I also want to take this opportunity to share with you a good news that Chinese government provides around 200 government scholarships this year to help more Indonesian students realize their dreams of studying in China. We welcome the students from Jakarta Muhammdiyah University to go to China for further study. Dear students, all of you are carrying the future of Indonesian journalism. I hope you study hard, make progress, be brave to pursue your dream to be a good journalist and make your contributions to the friendly exchanges between Indonesia and the rest of the world, particularly with China.